is a high performance, extremely linear externally modulated 1550 nm transmitter for HDO fibre optic CATV link. This transmitter type has been optimised especially for an analog channel line up to 550 MHz and a digital loading can be transmitted above 550 MHz. is a high performance directly modulated C-band DWDM transmitter for forward path fibre optic links in CATV and FTTx networks. HDO772 is able to carry analog loading up to 550 MHz and digital channels can be inserted on the whole frequency scale. HDO772 contains an electrical dispersion compensator that is important especially when analog channels are transmitted to longer distances. HDO772 is installed into HDX installation frame and the transmitter is available on different optical wavelengths in accordance with the ITU wavelength grid. The optical output power is adjustable that enables the equalising of channel power in multi-wavelength cases when optical amplifiers are utilised. HDO772 has two equal input sections with level and slope adjustments to support broadcast and narrowcast signal distribution. The RF isolation between the input branches is high minimising the leakage of narrowcast signals into unwanted narrowcast node segments. 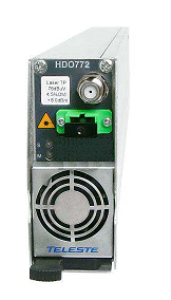 The power consumption is low but HDO772 still offers the high performance and the widest variety of features. is a high performance O-band DWDM DFB laser transmitter for forward path (downstream) fibre optic links in CATV networks. It is installed into HDX installation frame. 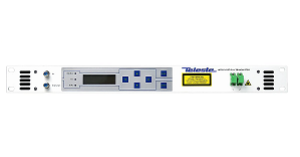 HDO904 is available on different DWDM wavelengths in 1310 nm window to support a node segmentation. for forward path fibre optic links in CATV and FTTx networks. The module is installed into HDX installation frame. HDO905 is available on different optical output power and distortion categories to fit various performance requirements. 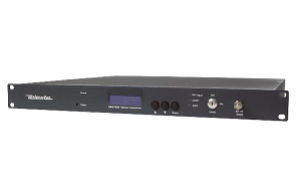 HDO905 has two equal input sections with level and slope adjustments to support broadcast and narrowcast signal distribution. The RF isolation between the input branches is high minimising the leakage of narrowcast signals into unwanted narrowcast node segments. HDO905 power consumption is low but HDO905 still offers the highest level of performance and the widest variety of features, including the internal spectrum analyser module. An integrated WDM filter is available as an option for applications where 1310 nm forward path and CWDM return path is transmitted in one fibre. Different optical output power classes are available from +2 dBm up to +15 dBm. is a high performance, extremely linear externally modulated 1550 nm transmitter for fibre optic CATV links. This transmitter type has been optimised especially for an analogue channel line up to 862 MHz.